The value of the currency adjusts in such a way that the current account is equal to the financial account. Remember that the reserve assets are part of the financial account, currency interventions represent outflows in the financial account, a “minus”. For countries with a high current account surplus, the currency appreciation can only be stopped when the central bank intervenes and increases the financial account deficit (possibly the Swiss case from 2014 onwards) or even when it moves the financial account from surplus into deficit. An example for the latter case are the interventionist “C-countries”: China, Chile, Czech Republic, C(K)orea or the Swiss (country symbol CH) from 2008 to 2012. BBOP = Broad Balance of Payment = Current Account + Net Foreign Direct Investment (FDI) + Net Portfolio InvestmentIn an intervention case the financial account is able to preserve the balance against the current account at an unchanged FX rate, because purchases of foreign currency reserves help to weaken the financial account. The People’s Bank of China (PBoC) is used to these kinds of heavy interventions. 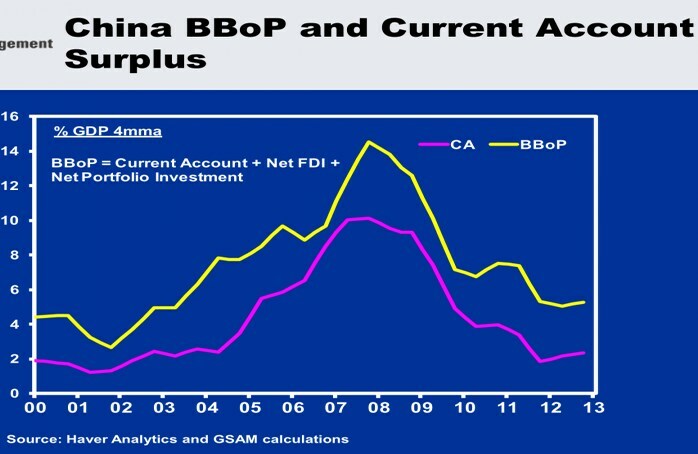 Both the Chinese current account and financial account (excl. 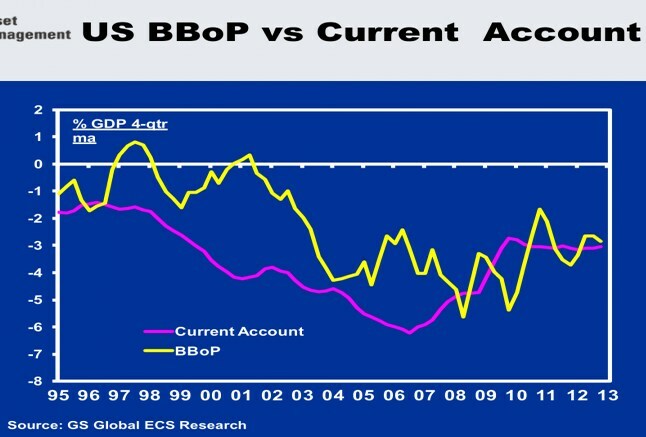 reserve assets) have been positive for many years, the BBoP is higher than the current account surplus. Such double-surpluses typically lead to low unemployment, then to higher wages and finally to higher inflation; and with these higher costs for companies the current account surplus weakens; a tendency perfectly visible in Jim O’Neill’s graph and the weak performance of the Chinese stock market. To stop inflationary and wage pressures the PBoC offers relatively high interest rates to Chinese banks, used reverse repos to absorb liquidity and it lets the yuan appreciate from time to time. The central bank targets the Shibor inter-bank rates; the 3M rates are currently at 5.5%. Investing in yuan-denominated bonds of high quality was therefore an easy win for investors. To avoid its own bankruptcy with the rising debt denominated in the strengthening yuan, the PBoC used its (rather small) seigniorage advantage1: it created a sovereign wealth fund and accumulated massive amounts of U.S. treasuries that lost in value with the “dying” US dollar. From 2012 onwards, the PBoC reduced slowly the interest rate, while rising wages resulted in lower and lower competitiveness. Finally the PBoC decided to reduce the value of the yuan a couple of times. 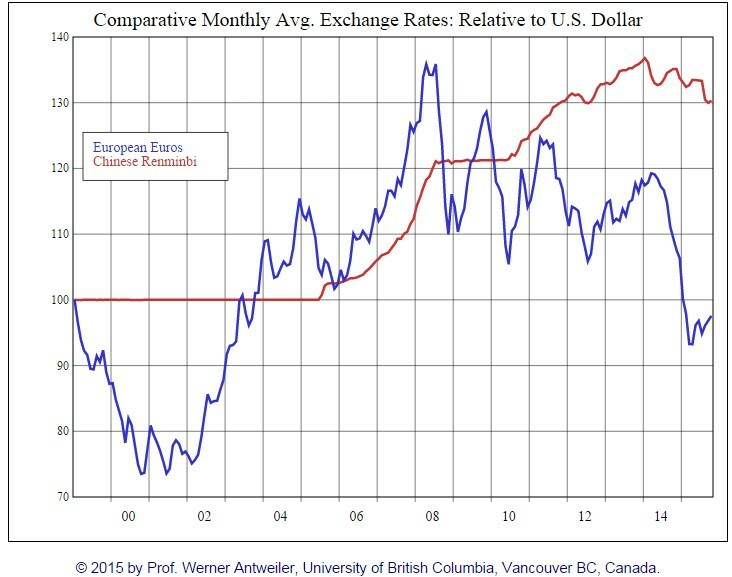 Therefore the dollar can do nothing else but depreciate over the mid- and long-term. The different forms of Fed’s monetary easing since 9/11 2001 – low interest rates and QE – have accentuated the descent of the US currency and the flight out of the dollar through the financial account. Since the PBoC does not want to go bust, it must continue to buy the Greenback, even if there are rumours that it increased the euro share. With rising salaries and more consumption the Chinese current account surplus to GDP ratio has fallen during the three-year boom of the emerging markets from 2009 to 2012. Europe, lead by Germany and accompanied by former deficit countries Italy and Spain, have partially replaced the Chinese as sponsor for financing the U.S. current account deficit. The United States itself reduced spending and the twin deficits. Thanks to shale gas and oil, a further reduction of the trade deficit is possible, something that could give stability to the dollar. The Swiss are another sponsor of the U.S. deficit and debt. Between 2002 and 2007, during a phase of increasing U.S. private debt, the (big) Swiss current account surplus was smaller than the financial account deficit; hence, the franc heavily depreciated often based on franc-leveraged positions. The SNB did not think that interventions for a stronger franc were necessary (we think that this was a mistake, see more). Between 2008 and 2012, a phase of global debt reduction, both Swiss current account and financial account (excl. reserves) were strongly positive. The SNB had to intervene heavily to maintain the balance. The Swiss current account surplus for 2012 was at 11% of Swiss GDP. It increased to close to 13% of GDP in 2013. To maintain the equilibrium the financial account must generate outflows of 11% or 13% of GDP resp. In 2012, this “Herculean task” was achieved only thanks to SNB interventions, in 2013 the so-called “American recovery” helped to accomplish the same task, this time without intervention.